Please help your friends, relatives, and neighbors to become registered and informed voters. Links to voting forms, information, services, and more are available in the links on this page. 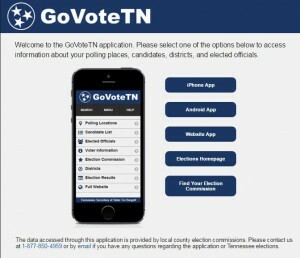 Information in the application is provided by Tennessee county election commissions. It is available for iOS and Android mobile devices, as well as online. You must be a qualified voter to register. View voter qualifications. Starting in 2012, registered voters in Tennessee must show government-issued photo identification in order to cast a ballot at the polls. The law requiring a government-issued photo ID only applies when voting at polling places. It does not apply to those casting absentee ballots. * Please see specific requirements HERE. An Absentee Ballot Request can be downloaded HERE. Contribution Limits have been updated for 2015 and 2016 based on changes in the CPI. Changes are effective January 1, 2015. Click here for the new 2015-2016 limits.